Abstract The impressive ensemble of monolithic stone sculpture and megalithic architecture on Rapa Nui (Easter Island) constitutes a unique coastal landscape. As central places and integral features of the overall settlement pattern, the main function of these complexes was funerary. Every upright statue subtly encoded and displayed a unique and localized history directly linked to individual social groups and their hereditary lands. When Katherine Routledge, co-leader with her husband, William Scoresby Routledge, of the Mana Expedition to Easter Island arrived in 1914, fifty years of colonial exploitation had nearly erased the oral history record, and with it associated group origins and identities. Consulting with a small knot of surviving Rapanui elders who acted as interpreters and guides, Routledge recovered and then jealously guarded a precious collection of observations, testimonies and reflections that today constitute an ethnographic data archive of major research value. Collaborating closely with a Rapanui consultant known as Juan Tepano, Routledge located and then drew outlines of what she believed were viable social group boundaries, thus lending concreteness and credibility to ownership claims. In this discussion, I evaluate and reinterpret Routledge’s indigenous boundaries using recent GPS mapping data, recovering some probable associations of specific descendant Rapanui social groups with certain megalithic sites. The goal is to restore the broken linkage between land, the monolithic statues and Rapanui group identity. 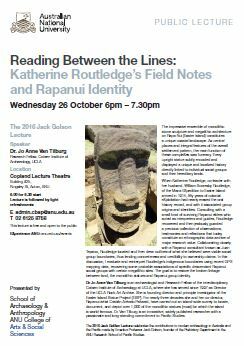 Katherine Routledge’s Fieldnotes and the Easter Island Statue Project (EISP): Reconstructing Excavations and Recovering Records. “Using another person’s fieldnotes can entail more, I learned, than simply culling facts and figures from them. Inscribed there also, in a sense, are specific social relations, the close involvement or rapport established with particular individuals.” Nancy Lutkehaus (1990: 314). Abstract Early Rapa Nui (Easter Island) reconnaissance and surface survey by several individuals or institutions was undertaken without the benefit of modern methods but, in fact, a great deal was accomplished. Excavations, however, were often conducted randomly and without proper care or oversight. In Rano Raraku statue quarry alone, the EISP research team has established that ~100 excavations took place but are only perfunctorily reported (or otherwise unknown). At least 50% of these interventions were carried out by the Mana Expedition to Easter Island, led by Katherine and William Scoresby Routledge (1913-1915). The only source of alternate or supplementary archaeological data for that work is provided by Katherine Routledge’s unpublished field notes. During pre-excavation research leading up to our own excavations and re-excavations, the EISP research team was required to 1) recover specific details from Routledge’s unpublished fieldnotes and 2) reconstruct as fully as possible the extent of her unreported interventions. An image catalog (~90,000 images) was amassed and a descriptive database for ~5,000 megalithic objects created. These materials, combined with narrative descriptions and metrics, constitute a major comparative data set that facilitates on-going documentation and preservation initiatives. Routledge personally took statue measurements in seven attribute categories with help from known Rapanui assistants. Other measurements of site or feature types were taken by her husband while she acted as recorder. These metrics, along with detailed studies of over 200 museum objects, have re-contextualized artifacts and allow for conjectural determinations of excavation levels and statute distances. Thus, we have updated Routledge’s fieldnotes, described her methods, clarified her oversights, united our own fieldwork with archival preservation and gained greater control over excavation outcomes. Díaz-Andreu, M. and M. L. Stig Sørensen 1998. Excavating Women A history of women in European archaeology. London and New York: Routledge. Gacs, U., A. Khan, J. McIntyre, R. Weinberg (eds.) 1989. Women Anthropologists Selected Biographies. Urbana and Chicago: University of Chicago Press. Hotus Chāvez, A. y Consejo de Ancianos Rapanui 2007. Te Mau Hatu o Rapa Nui Los Soberanos de Rapa Nui. Segunda Edición. Santiago de Chile: Editorial Emisión y el Centro de Estudios Politicos Latinoamericanos Simón Bolivar. Karttunen, F. 1994. Between Worlds Interpreters, Guides, and Survivors. New Brunswick, N.J.: Rutgers University Press. Lutkehaus, N. 1990. Refractions of Reality: On the Use of Other Ethnographers’ Fieldnotes. In R. Sanjek, ed. Fieldnotes: The Makings of Anthropology. Ithaca and London: Cornell University Press, 303-323. Lyons, C. L. and J. K. Papadopoulos (eds.) 2002. The Archaeology of Colonialism. Los Angeles: The Getty Research Institute. Routledge, K. 1919. The Mystery of Easter Island. London: Sifton, Praed. Sanjek, R. (ed.) 1990. Fieldnotes: The Makings of Anthropology. Ithaca and London: Cornell University Press. Smith, R.J. 1990. Hearing Voices, Joining the Chorus: Appropriating Someone Else’s Fieldnotes. In R. Sanjek, ed. Fieldnotes: The Makings of Anthropology. Ithaca and London: Cornell University Press, 356-371. Van Tilburg, J. 2003. Among Stone Giants The Life of Katherine Routledge and Her Remarkable Voyage to Easter Island. New York: Scribner.